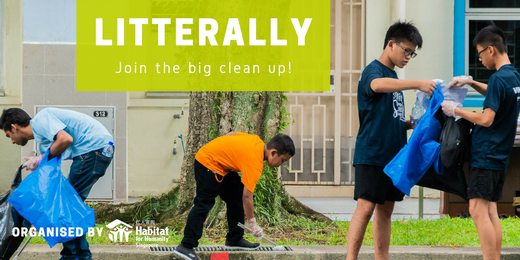 LitteRally is Habitat for Humanity’s first ever mass advocacy event that aim to mobilise 1,000 members of the community in a single day to participate in a mass litter picking session from Bishan, Marymount and Ang Mo Kio MRT and culminating in a carnival at the Promenade @ Bishan-AMK Park. This event is part of the Keep Singapore Clean Movement that we are doing in collaboration with Public Hygiene Council and graced by the Minister for the Environment and Water Resources Masagos Zulkifli. Through LitteRally, Habitat for Humanity wishes to reclaim public spaces by showing that we care for the environment by picking up litter on our own accord rather than rely on cleaners who already do this arduous and thankless task day in and day out.